CapTel Captioned Telephone, Hearing Loss Phones, Hard of Hearing - Weitbrecht Communications, Inc. Ideal for people with some degree of hearing loss, the Captioned Telephone (CapTel™) works like any other telephone with one important addition: It displays every word the caller says throughout the conversation. 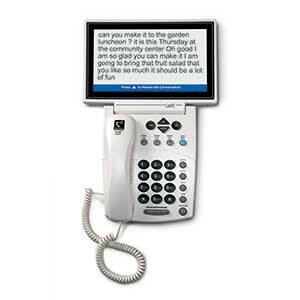 CapTel users can listen to the caller, and can also read the written captions in the CapTel's bright display window. The CapTel 840i captioned telephone combines the convenience of a telephone with the text capabilities of the Internet, showing you helpful captions during your phone conversations. Requires telephone service and high-speed Internet access. Designed for people who are comfortable with touch-screen technology, the CapTel 2400i features a large easy-touch display with multiple font sizes and colors for easy reading. This remarkable phone works like any traditional telephone, but it also shows you written captions during your telephone conversations. Can’t quite hear what they say? Just check the captions! Requires analog telephone line(s). DSL supported if appropriate filter in place.